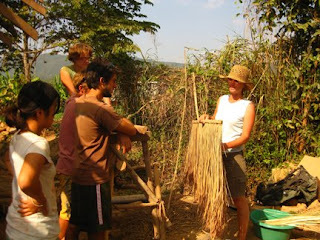 Peggy teaches us about the local grasses used for thatching. 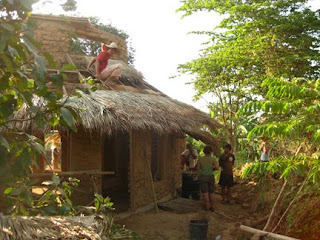 This is by far the most common way to roof your home in this part of Thailand. 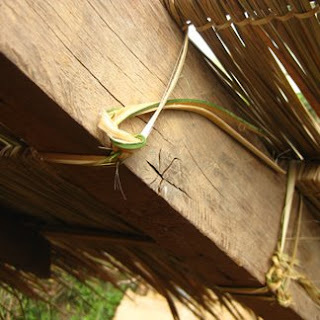 The grass is wrapped around a piece of split bamboo and tied tightly to it. 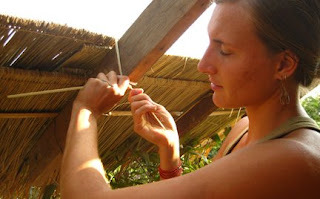 We use strips of bamboo to fasten each section of thatch on to the roof framing. We thatch from the bottom up, each layer is about 4 iches above the previous row. 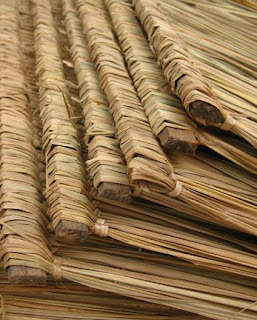 Thatch is a great way to roof in the tropics because hot air that accumulates in your home can natural vent out, while any rain that hits the material will run along the blade of grass and drip along the edge only. 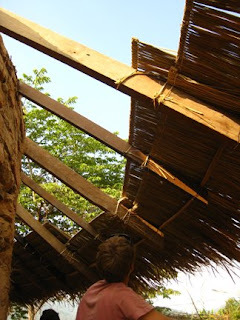 This system lasts quite long, the thatch will only need to be replaced about every five years.